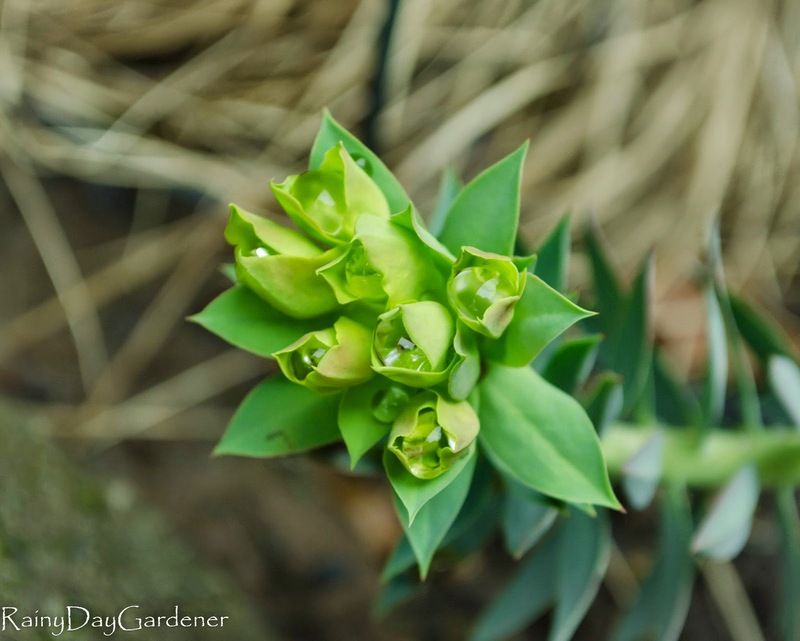 In between 'pineapple express' rainstorms, I ventured out to snap up some pictures today of what is blooming in my winter gardens. I'm fighting a nasty winter cold and getting a bit of cabin fever. My collection of hellebores are all blooming, except two, which should bloom in the next month. Apricot Blush Helleborus just beginning to open. The color is always richer in the beginning of the bloom season and fades into more peach and yellow as the bloom remains. I love the foliage on my corsican argutifolius 'Pacific Frost' helleborus. The green and silver leaves are serrated and the blossoms are apple green colored. They have smaller blossoms than my other helleborus, but so dainty and perfect. 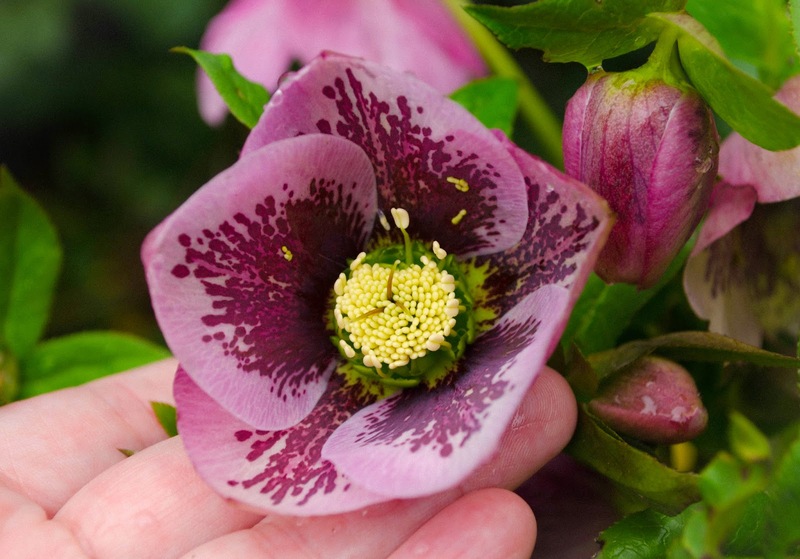 Another pink winter bloom is Spring Promise 'Charlotte' helleborus orientalis. This bloom is just beginning to open and it will fan out. It is a really stunning and colorful, single blooming helleborus. Here are a pretty pair, erica darleyensis 'Mary Helen' with helleborus 'Blue Lady' in the background. 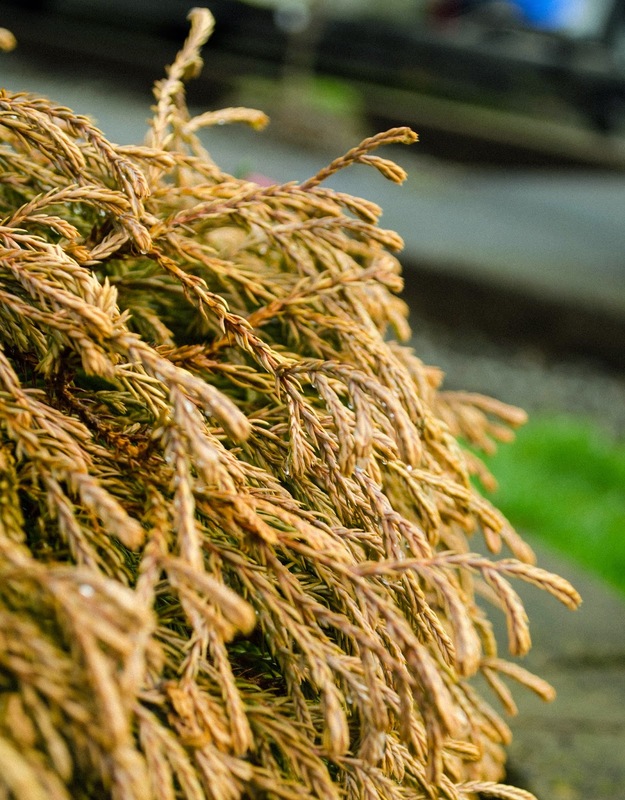 This variety of erica darleyensis is striking in the winter because some of the foliage turns copper colored for great winter interest. 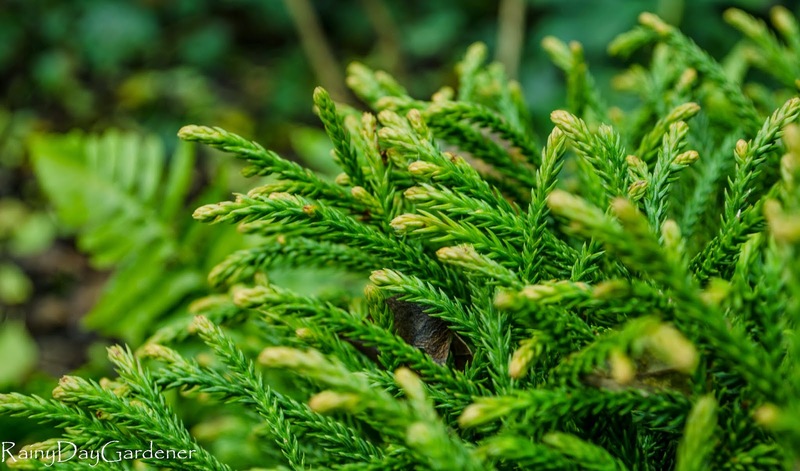 Speaking of copper colored foliage, Thuja occidentalis 'Golden Tuffet' is really putting on a penny shine right now. Amazing winter color with braided texture. Many spring plants are popping up and charming me with their sweet, fresh, baby leaves. I'm seeing lupines and aquilegia, plus the spring bulbs are breaking ground. Daffodils are around the corner. 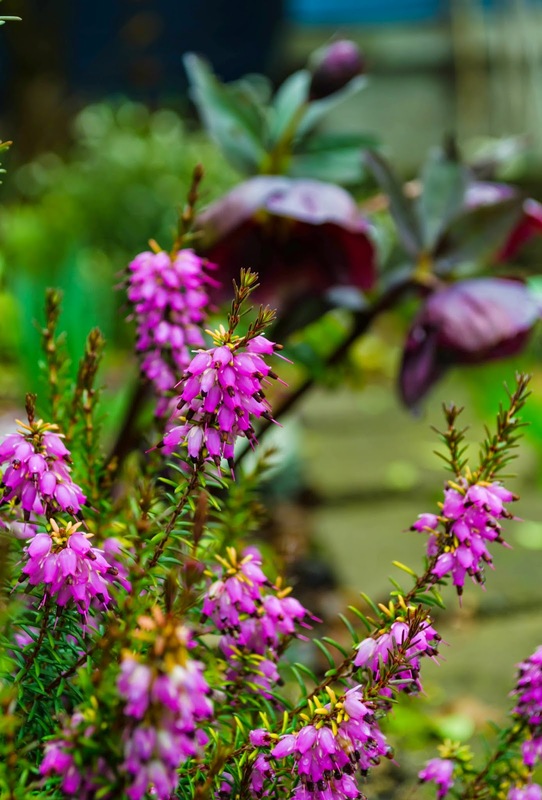 Winter heath is coloring up the flower beds. These hardy varieties have been a staple in my gardens over the years. Below is my newest acquisition. 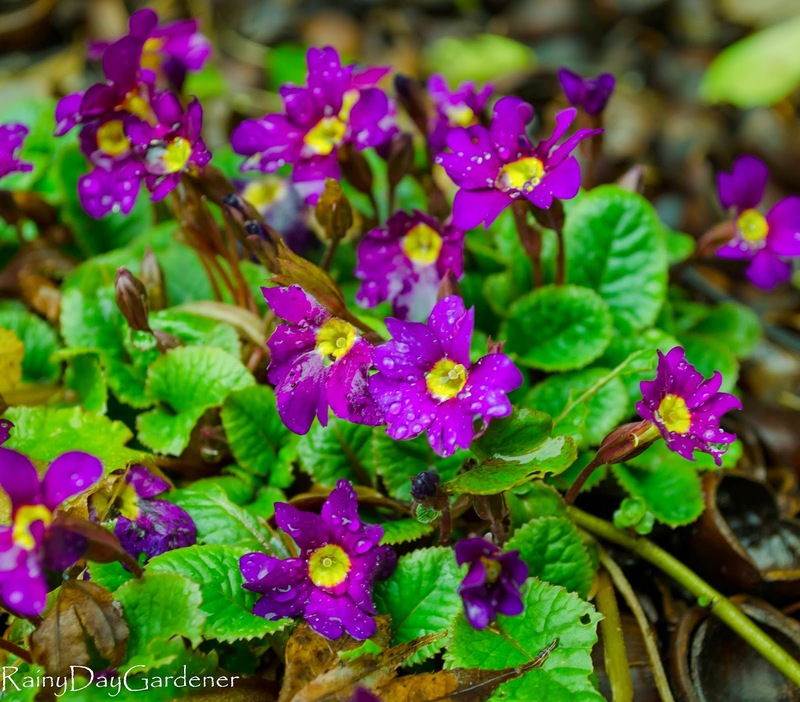 Ground cover with pops of color, this primula is an unknown variety and was brought over from our former house. Cheerful little guys spread nicely and are happily transplanted. And finally, budding blooms on my Euphorbia rigida. I've been watching my little starts from last year like a hawk...it's been pretty wet and I'm not sure how happy they are. In the background is 'Frosted Curls' carex comans. So, there's my little winter garden and my little break outdoors. It's back to a drenching, downpour outside. Ah, winter in the mild and wet Pacific Northwest. Your garden's jewels are gorgeous, especially with your close-up photography. Interesting how much farther along your plants are than mine. Well, hopefully we'll have a few dry hours this week. I hope you're feeling better. It's been overall, pretty mild up here, especially the night time temperatures. I'm thinking that must be the catalyst for the earlier blooms? Hoping for a few dry hours this week too! Thanks Grace! Jenni - those are beautiful photos of beautiful plants! In my opinion, you can never have too many Hellebores. Don't know what it is about them, but I love them. Sorry to hear you are sick - hope you feel better soon! I 100% agree with you Anna! 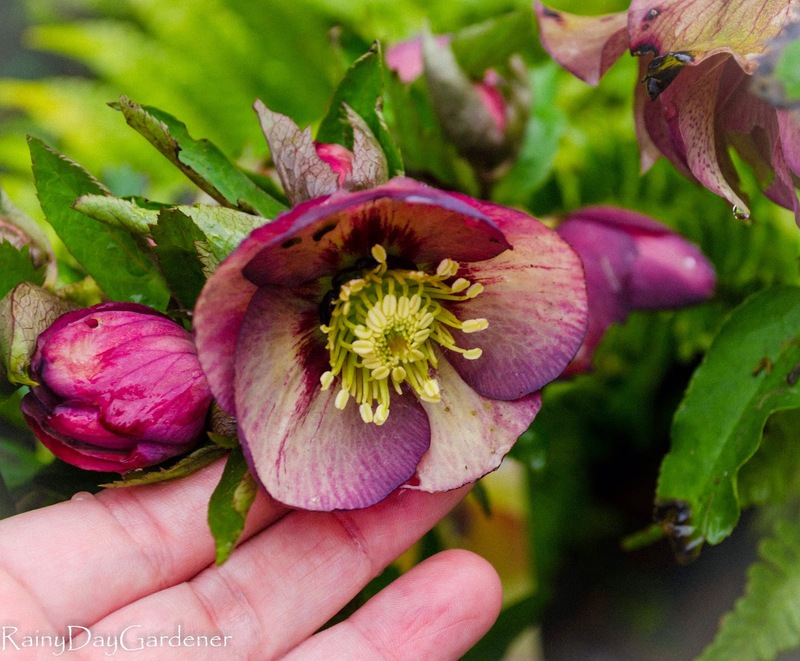 I'm planning to acquire more hellebores this month :) Thanks for the get well thoughts! I hope you feel lots better soon. I love all the little fresh baby leaves too. You have quite a bit more color than I do. So great to see. Alison, it was you who originally inspired me to really start focusing on foliage. I always admire your blog posts with your intricate vignettes of bloom and foliage! You have a good show of colour already. 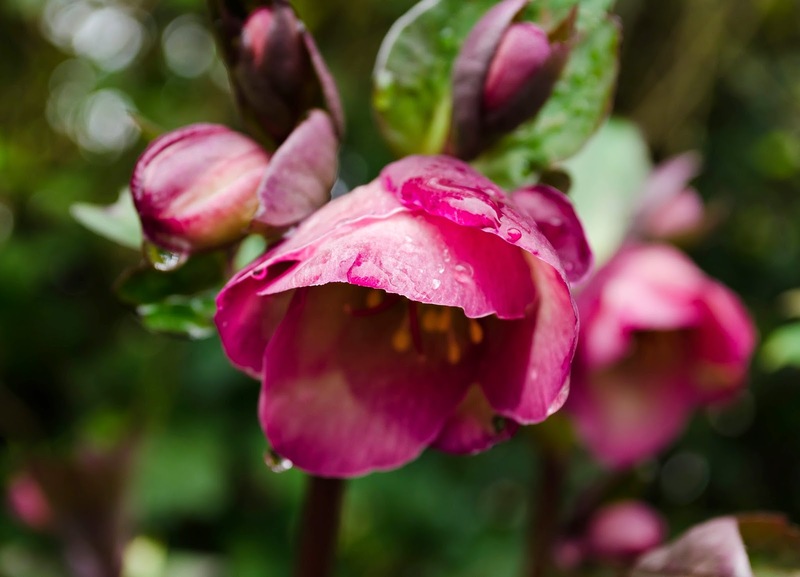 Those Hellebores are spectacularly beautiful; a real inspiration. 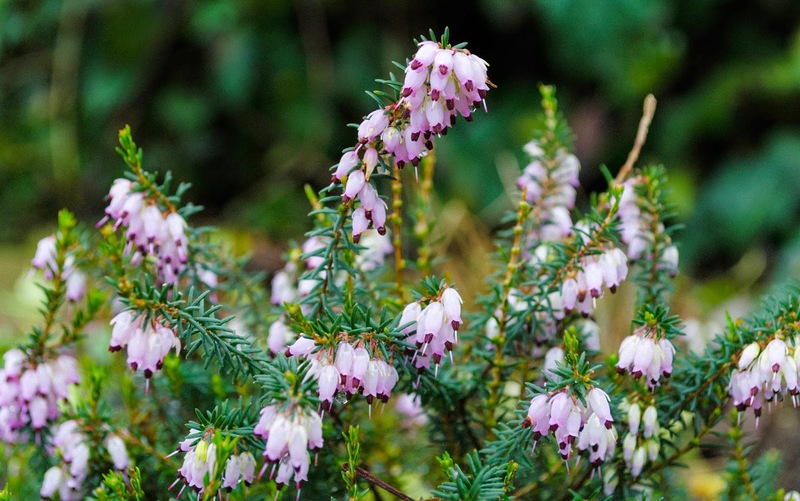 I am trying to establish a patch of them in my own garden, but I am finding that they grow very slowly, and their buds take ages to open fully. Hi Mark, they do grow slowly and the takes the buds awhile to fully develop, but the results are so worth the patience. The flowers last for months. 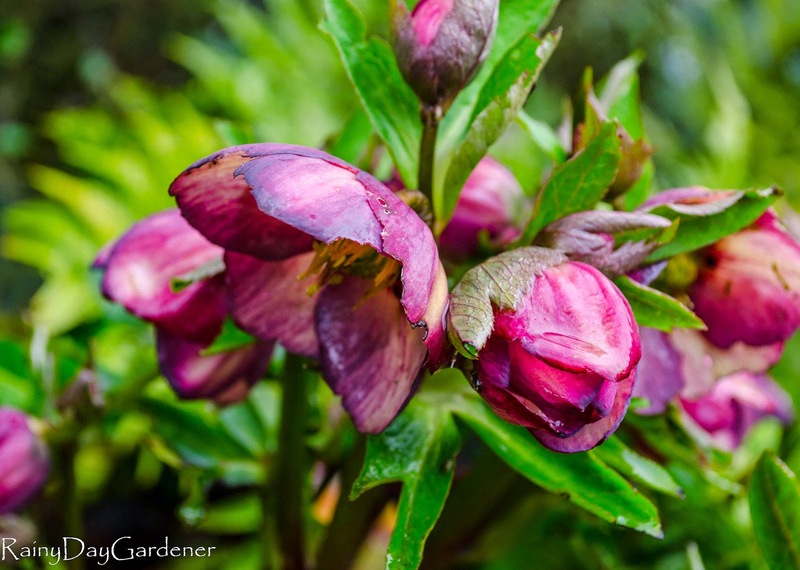 I've seen patches of hellebores that were over 30 years old and they are amazing, so prolific and masses of late winter color. Hope you feel better soon. Your photos are wonderful. Hang in there, spring will be there pretty soon. Happy Valentine's Day week to you too FL! Beautiful helleborus. 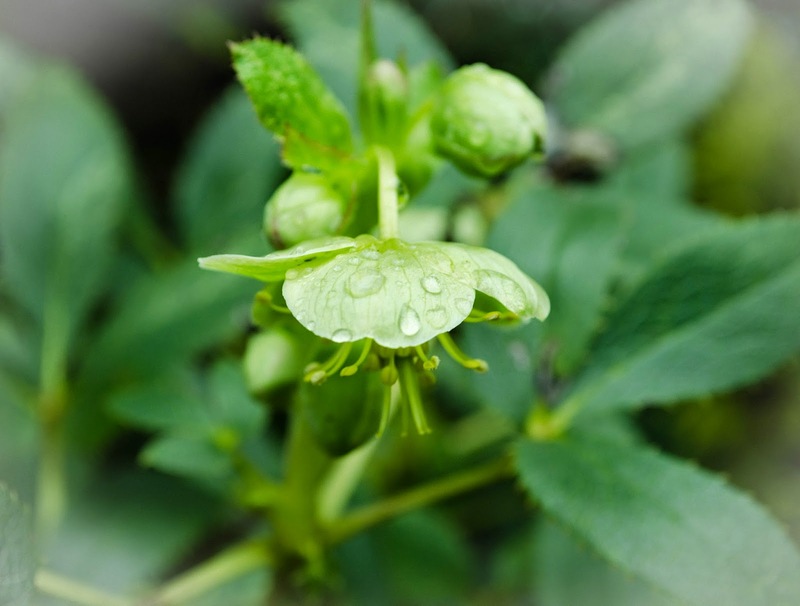 I hope my Helleborus will open soon. I imagine you are just a week or so behind, although the Netherlands has gotten a bit of snow recently..while it's been very mild here. I see that the weather in the Pacific Northwest is milder than in The Netherlands. Only a few Helleborus plants start flowering, I think we have to wait another two weeks. Janneke, I think the snow you've had recently will have slowed some of the blooms down, but they will come :) I'll be looking forward to your pictures. Beautiful collection of hellebores! I love the coloration of 'Charlotte'. It's nice to see your garden waking up - here in the midwest still frozen ground under snow. 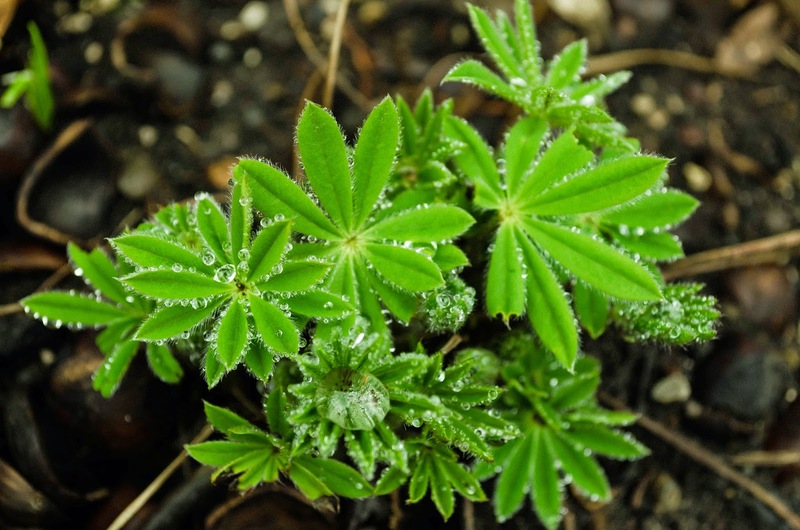 I also grew lupines from seed once - they were lovely while they lasted, but did not like our hot, humid summers. They should be perfect for your climate - wish they liked it here better - so pretty! I like the whorled foliage as well as the flowers. We are supposed to dry out later in the week. I hope it coincides with you feeling better so you can enjoy it. I enjoyed your post looking back at your last May's gardens! Lupines generally do well here, as do many traditionally 'cottage' plants. We grow vigorously here! Just beautiful. Can you believe my beds are melted off? My primroses are looking perky. Maybe I will have some early flower posts. I really love the textures and colors you have. I just purchased my first hellebore and am looking for the perfect spot for it. Any tips for a hellebore newbie? Yes :) A spot that gets fall and winter, early spring sunshine, then is shaded in our hot summers. I like to place them under deciduous trees, around their canopy umbrella. They are not super high maintenance, but will require some summer water. Think of places were you would put hostas or ferns, but if you have a spot that allows them to shine in the winter and be admired, that is truly the best :) I get so many compliments on the ones I have placed in my front yard. 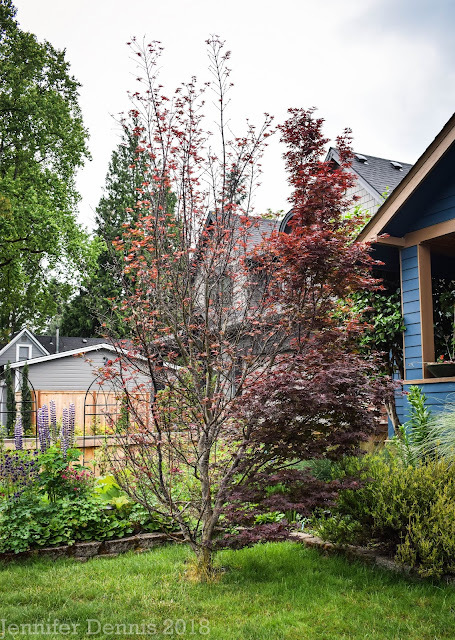 They are shaded in the summer by Japanese maples and a privet hedge. Erica, Primula, and Hellebore - looks more like spring than winter to me.